Welcome To Academy Sports + Outdoors Vendor Seminar NYK Logistics Session June 08 & 09, 2009. 2 10 + 2 Background In order to meet the requirements of the Security and Accountability (SAFE) Port Act of 2006, Customs and Border Protection (CBP) is requiring carriers and importers to submit information 24 hours before lading that is reasonably necessary to improve CBPs ability to identify high-risk shipments so as to prevent smuggling and ensure cargo safety and security. 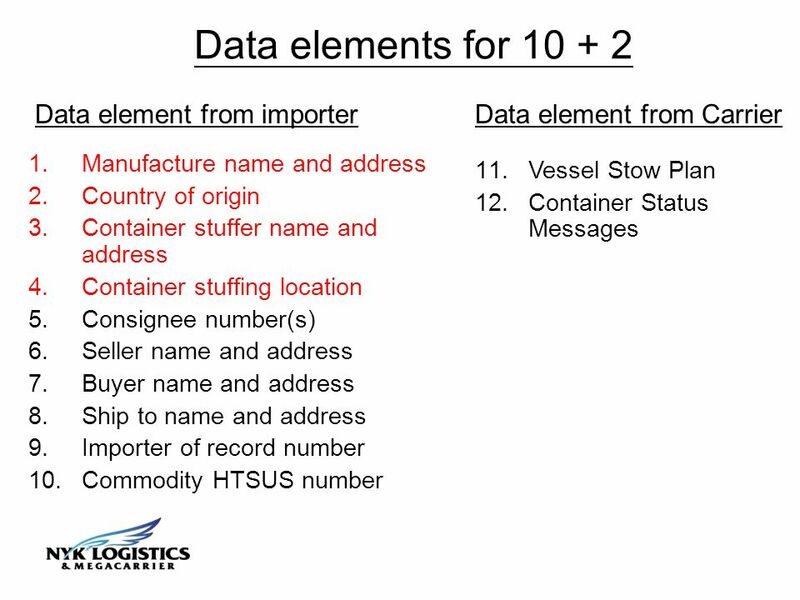 CBP is requiring 10 data elements from importers and 2 data elements from ocean carriers which will constitute the Importer Security Filing. This has become commonly known in the trade as 10+2. 5 New Feature in eBooking System Service Provider eBooking user(s) is/are able to maintain the Service Provider template : * Manufacturer (or supplier) name and address – Name and address of the entity that last manufactures, assembles, produces, or grows the commodity or the name and address of the supplied of the finished goods in the country from which the goods are leaving. * Consolidator (stuffer) name and adderss – Name and address of the party who stuffed the container or arranged for the stuffing of the container. 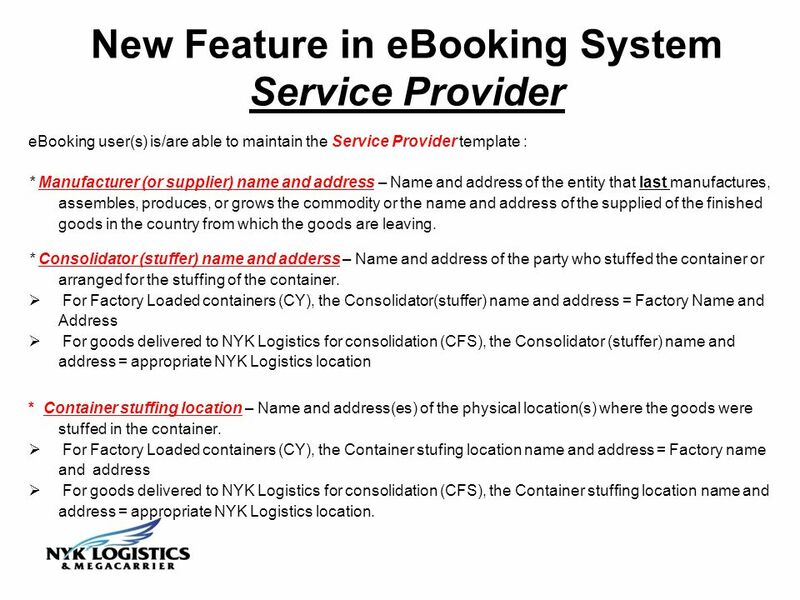 For Factory Loaded containers (CY), the Consolidator(stuffer) name and address = Factory Name and Address For goods delivered to NYK Logistics for consolidation (CFS), the Consolidator (stuffer) name and address = appropriate NYK Logistics location * Container stuffing location – Name and address(es) of the physical location(s) where the goods were stuffed in the container. 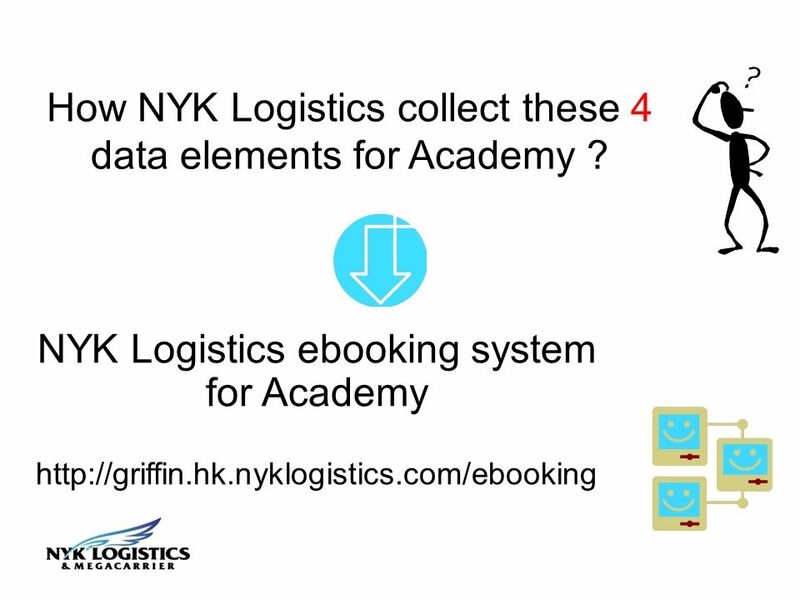 For Factory Loaded containers (CY), the Container stufing location name and address = Factory name and address For goods delivered to NYK Logistics for consolidation (CFS), the Container stuffing location name and address = appropriate NYK Logistics location. 8 1. 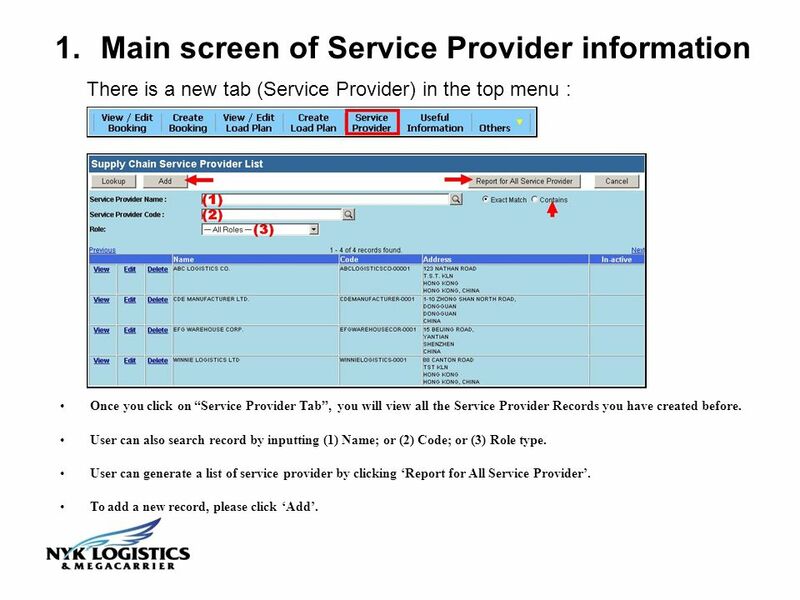 Main screen of Service Provider information There is a new tab (Service Provider) in the top menu : Once you click on Service Provider Tab, you will view all the Service Provider Records you have created before. User can also search record by inputting (1) Name; or (2) Code; or (3) Role type. User can generate a list of service provider by clicking Report for All Service Provider. To add a new record, please click Add. 9 Creating a new record Below are the mandatory data. Vendor must input them : (1) Name of the service provider (2) Address (3) City (4) Country code – please click to search User has to provide Province/State, Zip/Postal code and DUNS no. if applicable. One vendor can perform multiple service provider roles. Click Save to update the record. 10 2. 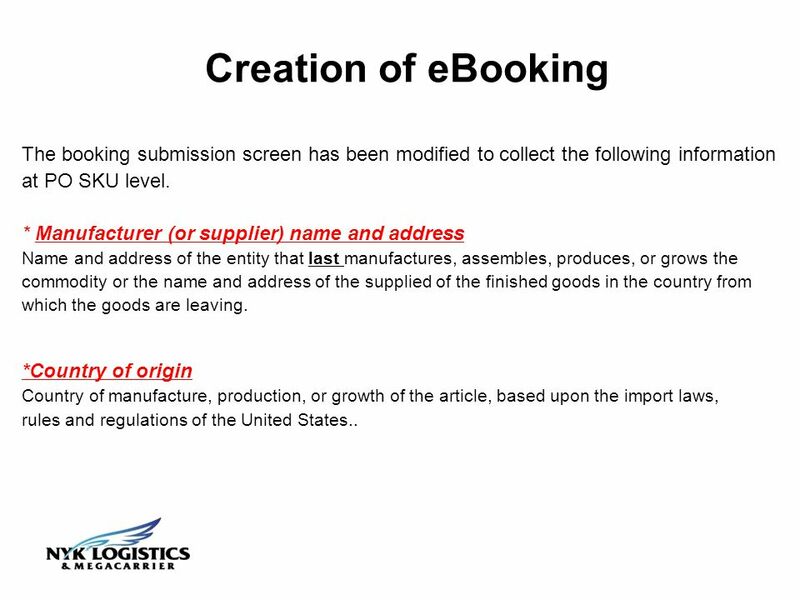 Adding Manufacturer and Country of Origin in Booking * For the Manufacturer info, please note that you can only select the companies who have the role defined as Manufacturer in the Service Provider tab mentioned in above step 1. 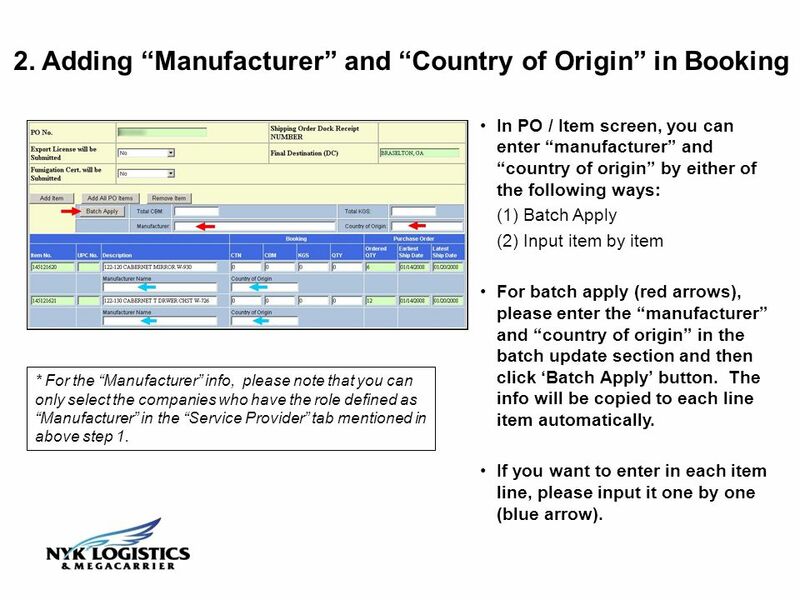 In PO / Item screen, you can enter manufacturer and country of origin by either of the following ways: (1) Batch Apply (2) Input item by item For batch apply (red arrows), please enter the manufacturer and country of origin in the batch update section and then click Batch Apply button. The info will be copied to each line item automatically. If you want to enter in each item line, please input it one by one (blue arrow). 11 3. 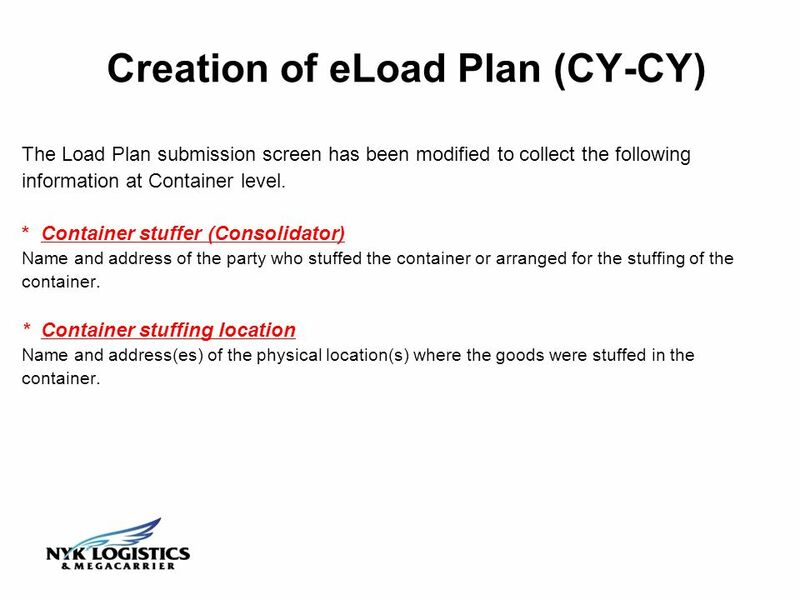 Adding Stuffer Name and Stuffing Location in Loadplan * Please note that you can only select the companies who have the role defined as Container Stuffer &/or Container Stuffing Location in the Service Provider tab mentioned in above step 1. 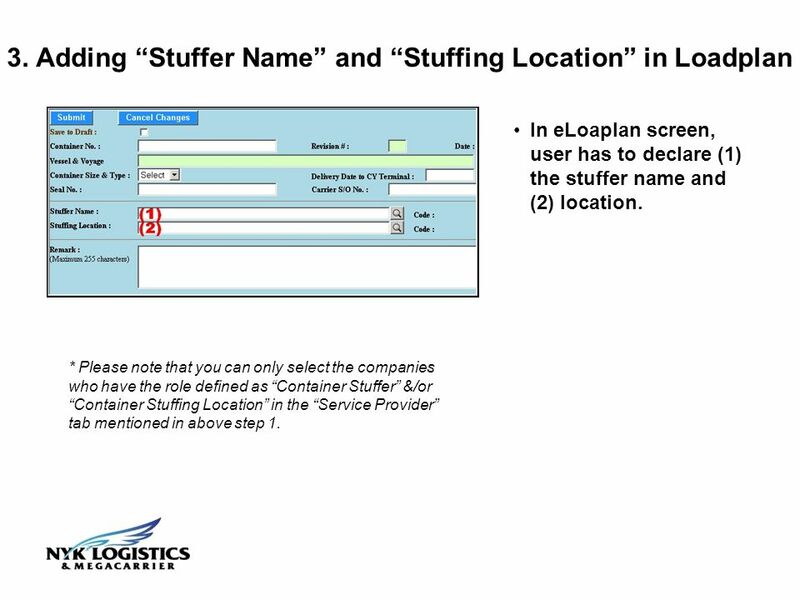 In eLoaplan screen, user has to declare (1) the stuffer name and (2) location. 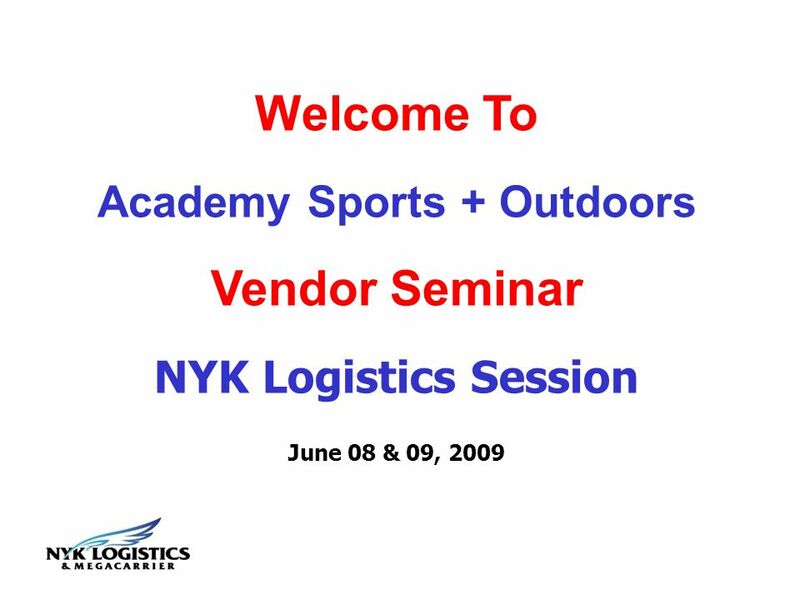 Download ppt "Welcome To Academy Sports + Outdoors Vendor Seminar NYK Logistics Session June 08 & 09, 2009." 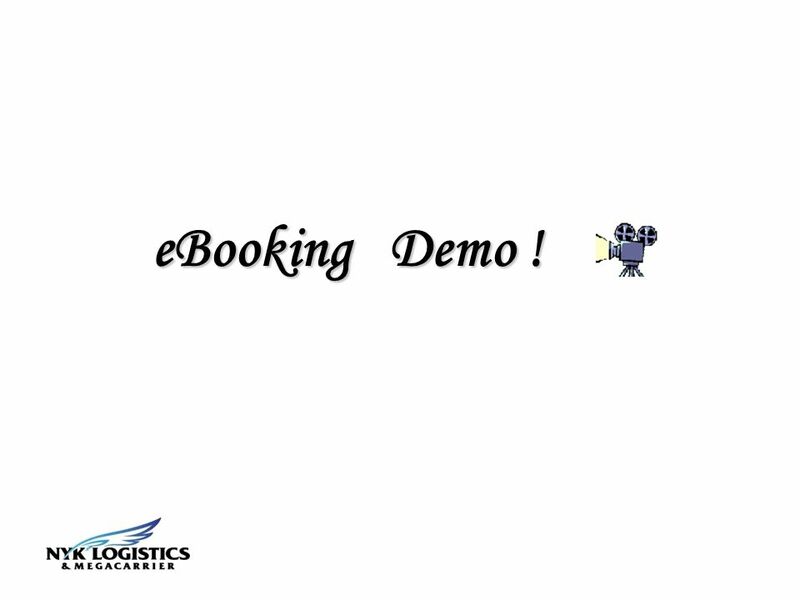 Introduction to INTTRA-Act Booking Q Proprietary and Confidential Copyright © 2005 INTTRA Inc. 2 INTTRA and Ocean Logistics Execution Notifications. Shipment Tracking (In Transits) RLM System. 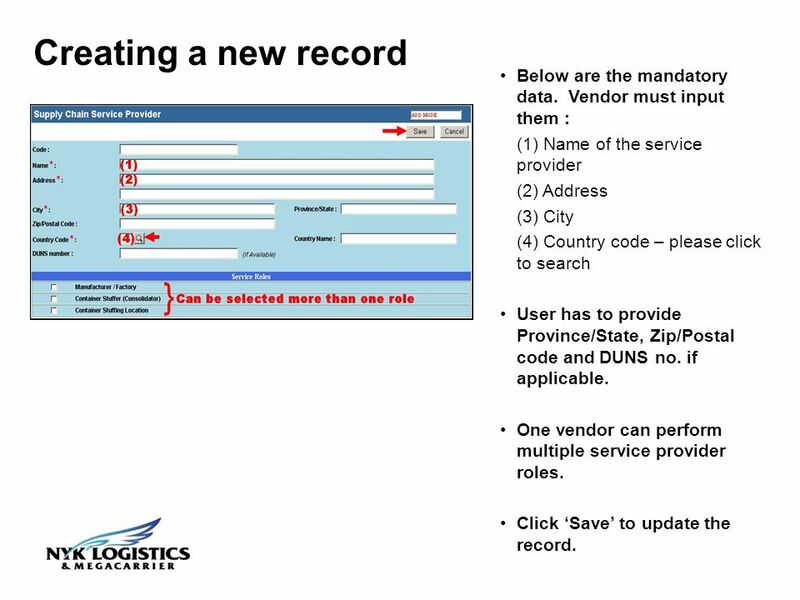 Shipment Tracking Records Shipment Tracking records (In Transits) are posted to the system to apprise the. Purchase Order Confirmation Process In Purchase Order Collaboration Scenario (POC) INVENTORY COLLABORATION HUB. STUDENT INFORMATION SYSTEM (SIS) Course Approval Procedure. Training Course: Task List. Agenda Overview of the Task List Screen Icons across the top Making Appointments Viewing Appointments & Filters Working Your. Importer Security Filing Program 1. Background on ISF Advance Trade Data Initiative (June 2004) CBP Targeting Taskforce (March – May 2006) SAFE. Importer Security Filing We’ll Make It Work For You. 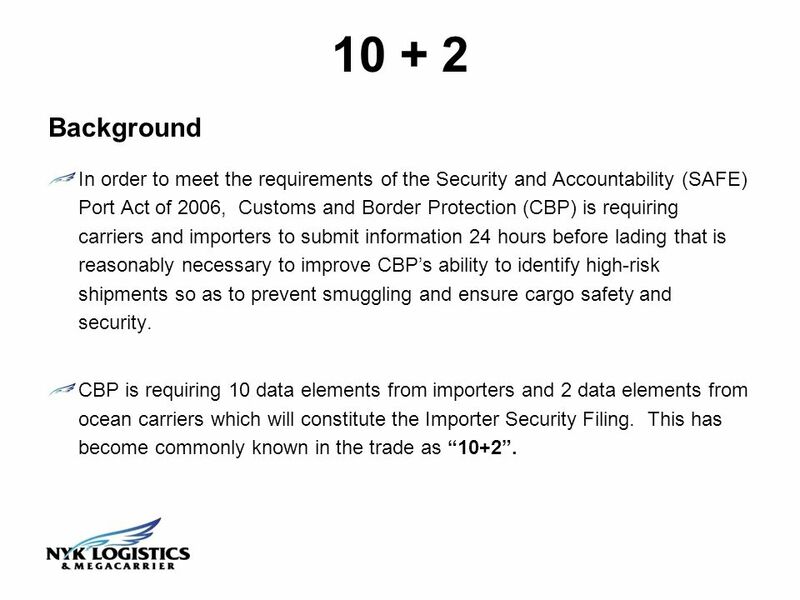 1 Importer Security Filing and Additional Carrier Requirements “10+2” Trade Outreach Webinar Spring 2010. On January 26, 2009, a new rule titled Importer Security Filing and Additional Carrier requirements went into effect. This rule is known as because. 1 Welcome!. 2 Today’s Speakers Joe Burks – Director Logistics, Cooper Wiring & President, ICPA Eric Kulisch – Associate Editor, American Shipper Beth.  Long Island Import Export Association Impact of Trade Compliance on Importers & Exporters *connectedthinking. January 16, 2008 Moderated by Mary Jo Muoio, NCBFAA President Peter H. Powell, Sr., NCBFAA Senior Counselor Alan R. Klestadt, NCBFAA Customs Counsel Importer.